A bold new fantasy, The Merchant Princes is a sweeping series from the hottest new writer in science fiction! Before the day is over, she's received a locket left by the mother she never knew-the mother who was murdered when she was an infant. Within is a knotwork pattern, which has a hypnotic effect on her. Before she knows it, she's transported herself to a parallel Earth, a world where knights on horseback chase their prey with automatic weapons, and where world-skipping assassins lurk just on the other side of reality - a world where her true family runs things. Taken in by her mother's people, she becomes the star of the story of the century-as Cinderella without a fairy godmother. As her mother's heir, Miriam is hailed as the prodigal countess Helge Thorold-Hjorth, and feted and feasted. Caught up in schemes and plots centuries in the making, Miriam is surrounded by unlikely allies, forbidden loves, lethal contraband, and, most dangerous of all, her family. Her unexpected return will supersede the claims of other clan members to her mother's fortune and power, and whoever killed her mother will be happy to see her dead, too. 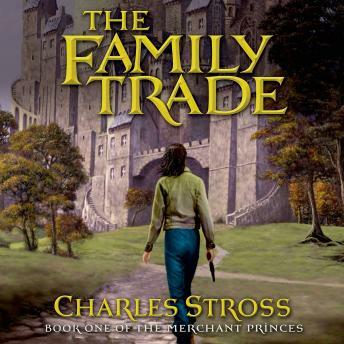 Blending creativity and humor, and the rigor and scope of a science-fiction writer on the grandest scale, Charles Stross has set a new standard for fantasy epics.